When the name of Joplin, Missouri is mentioned, many will think immediately of the 2011 EF5 tornado that devastated portions of the city. Joplin is so much more than that. It has a rich history reaching back before the Civil War. We stopped in the Joplin Museum Complex to learn more about this southwestern Missouri city. The official name of this portion of the museum complex is the Dorothea B. Hoover Historical Museum. It is laid out as an assembly of collections, with each having its specific gallery area. 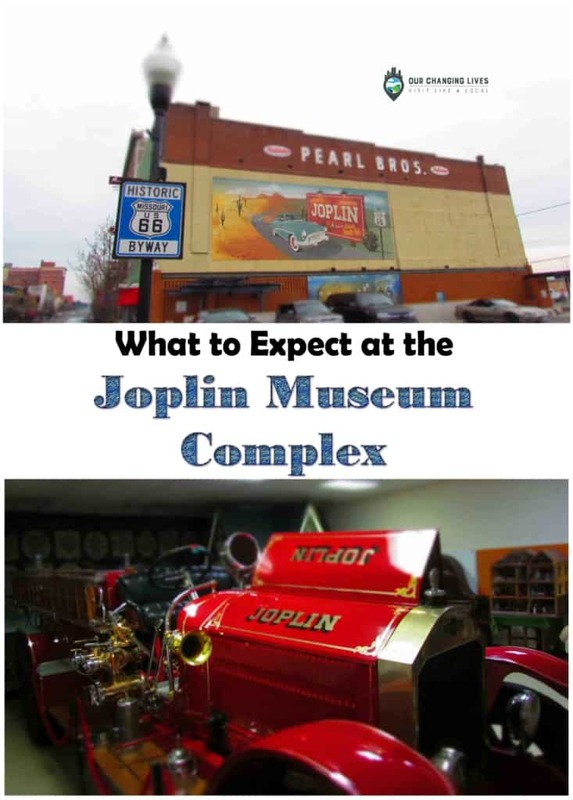 We want to thank the Joplin Museum Complex and Visit Joplin, Mo. for their hospitality. Rest assured that all opinions are our own. The creation of mining wealth brought with it some unexpected side effects. The Spring of 1902 saw a sinkhole form along one of the main thoroughfares in town. The enormous amount of underground work would leave the city over 70% undermined. Open shafts and left over rubble would be commonplace issues. The fortunes also brought great advancements to Joplin. A Carnegie Library addition showed that the city was quickly rising in status. Victorian accents were becoming commonplace in the architecture, as well as home furnishings. 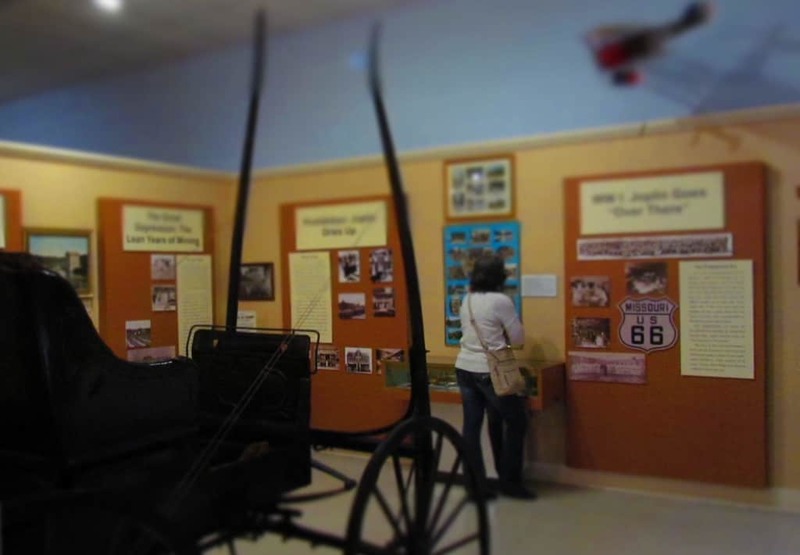 The Joplin History Museum has an area that showcases many of the pieces that would be commonplace in a Victorian themed home. Dining room, bedroom, and office furniture, as well as decorative accessories are on display. As the country grew, it became apparent that there was a need for better transportation alleys across the country. 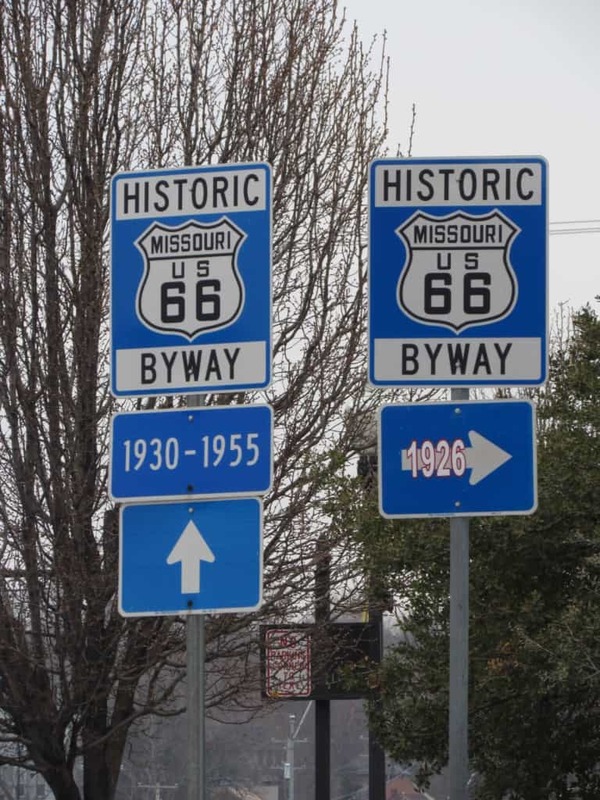 In 1926, Route 66 was designated to be a principal east-west artery. This roadway would run from Chicago to California. It gained the nickname of “The Mother Road” by John Steinbeck in his novel “Grapes of Wrath”. Each year, tens of thousands of travelers retrace the pathway to experience the nostalgia of days gone by. The Joplin Museum has a display dedicated to the 6 miles of the route, which pass through the city limits. While Crystal spoke with the museum curator, I wandered off to take pictures of the various collections. 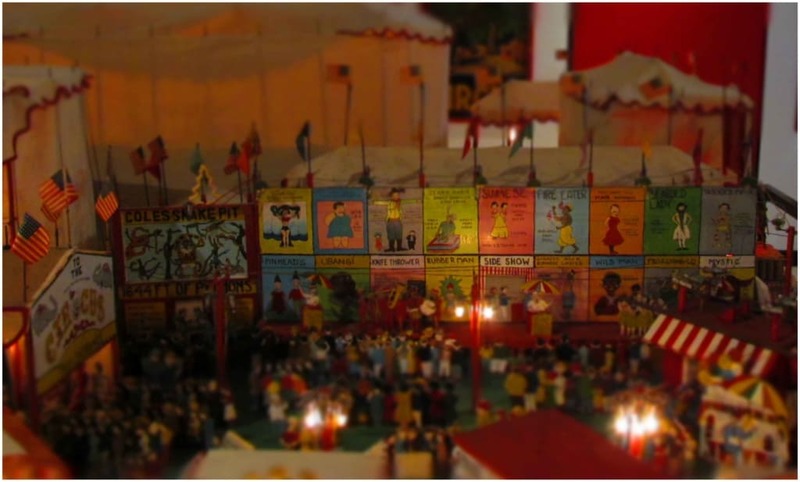 Just down the hall from the entrance, I located a room filled with miniature circus displays. I have always been enamored with the big top, and wish I would have had the opportunity to experience it in its heyday. The museum has a good size collection of replicas, and I enjoyed looking at all of the detail. My favorite version had to be the one that showcased a circus midway. The sideshow placard with all of the circus acts would have been so interesting to witness. I know much was just showmanship, but I’m sure many a kid stood mesmerized by the sights. The circus coming to town would have been the event of the year in many midwestern cities, and would have drawn crowds from towns all around. As I departed the circus exhibit, I came upon the cookie cutter displays. Here they have collected cutters that span decades of time. I saw many that I recognized from my childhood, as well as plenty that were clearly before my days. 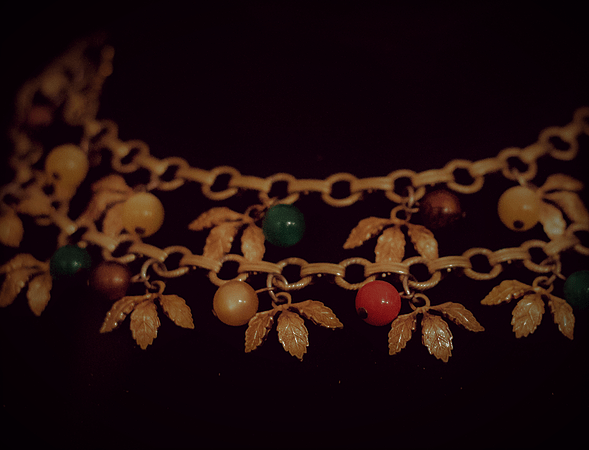 There are so many styles and shapes that we never realized had ever been created. They even have an area where each museum visitor can pick out their own cookie cutter to take home with them. Joplin has seen some important visitors through the years. While many they wanted to see, some were wanted in a different way. The Great Depression saw the creation of many crooks and gangsters. Bonnie and Clyde made a stop in Joplin, Missouri during 1933. After committing several bank robberies in the region, they chose to hangout in a garage apartment south of the downtown area. Suspicious neighbors alerted the police, who confronted the gang. A violent shootout left two lawmen dead, but in the hectic escape the gang left behind a variety of possessions. 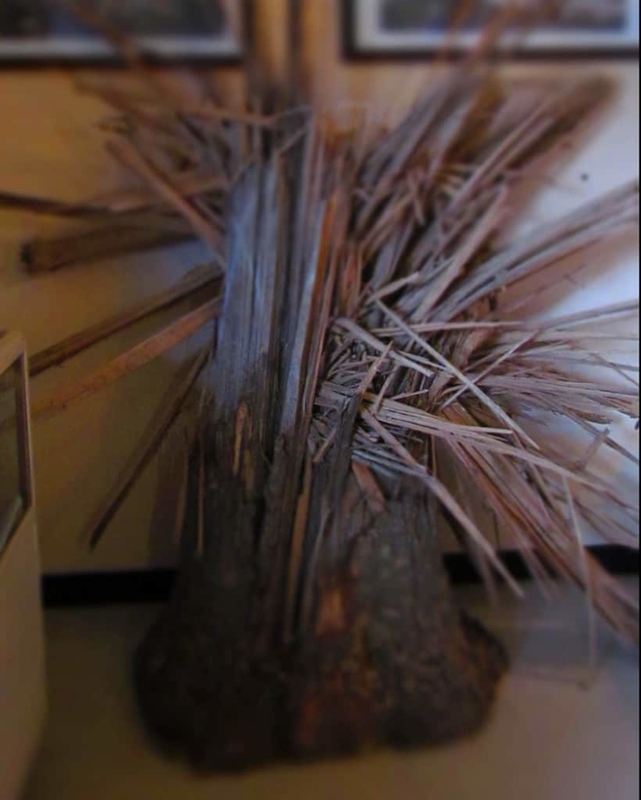 Many of these are on display at the museum. One of the things we love about regional museums is the abundance of artifacts. So much of the local history is preserved, and sheds a light on the changes that have occurred over the decades. 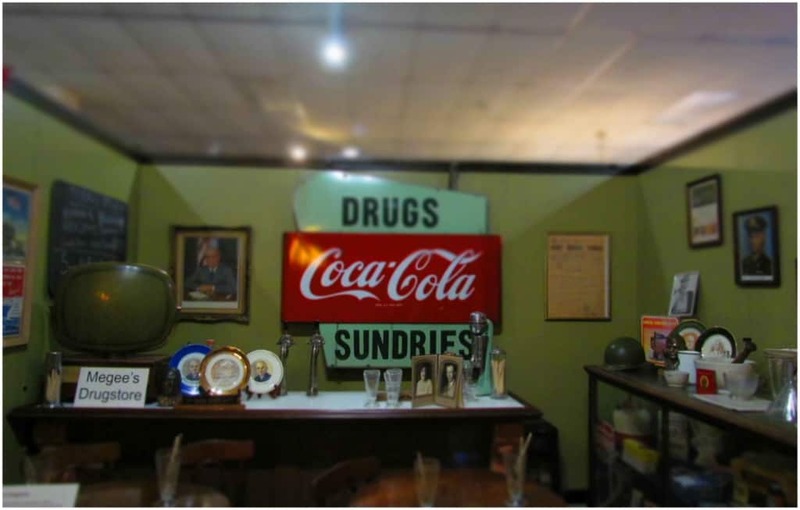 As we continued to explore, we found collections that highlight everything from the military to the medical profession, and even the changing technology that has been commonplace throughout the city. The Joplin Sports Hall of Fame features many players who performed locally. We even learned that a guy named Mickey Mantle played for the Joplin Miners in 1950. That year he won the division batting title with a .383 average. The next year he would be playing for the New York Yankees. This is an example of the kinds of unique facts you can discover at regional history museums. As you can see, Joplin is so much more than a city that was hit by a tornado. Why not make plans to learn even more about this unique Midwestern city? We are betting you will come away with a new perspective. Like this article? How about giving it a share? Your friends would love to see it, too! This is cool. I love the history! I’m going to have to check this out one day! We hope you can. Thanks for visiting us. Well museums reflect the life and culture of a place and a group of people. It is interesting but sometimes gives one goosebumps. I would never have guessed the Joplin history museum would be so interesting – both the cookie cutters and the miniature circus displays look so interesting and definitely unlike anything I’ve seen elsewhere! Very cool. It was certainly a surprise to us, as well. Makes for a fun visit when paired with the mining museum in the same building.